A tattoo is applied with a needle and a machine. What is the difference between permanent makeup and microblading? The first procedure is especially painful, has a long healing period. An old tattoo is difficult to remove. Eyebrow Microblading – What Is It? The adjustment is a manual work of a cosmetologist. The depth of penetration of the coloring matter is small – up to 0.5 mm. 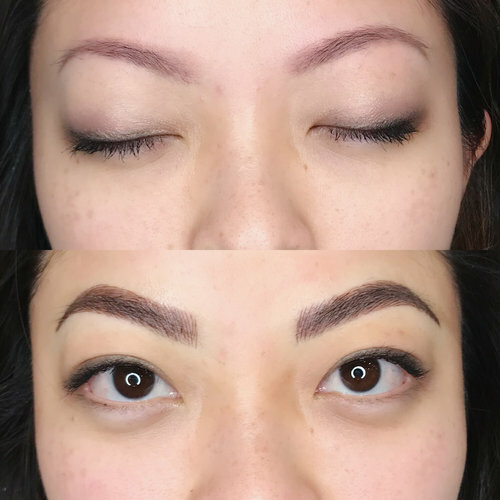 What is better – tattooing or microblading eyebrows? The second procedure is less painful. At the same time eyebrows look natural. Both methods of correction are about the same in price. The procedure can be used by any age woman, if there are no corresponding contraindications. Since you now understand what advantages microblading eyebrows can bring. This is a unique procedure that will now also be clear to you clear. Having done the procedure of microblading eyebrows once – you do not have to worry about the appearance of your eyebrows for a long time without any makeup. What is the average Microblading cost? Microblading ranges in cost from around $250 dollars to $450 dollars depending on the area and how much the owner wants to charge. If you don’t know what microblading is, it’s the practice of placing pigment with tiny strokes of a “microblade” in a semi permanent fashion over your existing eyebrows. Microblading does work in a similar way to a regular normal tattoo inking but, it doesn’t go anywhere near as deep into the skin, meaning that the effects do slowly fade away after some time. According to the many microblading eyebrow professionals, microblading can last between 12 months and three years. Should I get cheap Microblading Eyebrows done? No, you should always look for a professional. Microblading eyebrows done by people who charge way below average prices are usually newbies doing the procedures at their home. They don’t have the actual permit, bloodborne certified by the health department inspection, and are not sanitary. Going to a professional is the right choice, they know what they are doing since they have done more than 200-500+ hours clients. It will make a big difference going to a professional.